These saucy Asian BBQ lil’ smokies are a cinch to make and will be the big hit of your next party! Lil’ smokies are a classic. It’s usually my sister who brings them to a party but this time I brought them and gave them a new twist. Asian BBQ lil’ smokies are officially a hit at our house and they’re really so easy to make. The best part is that you can just throw them in the crockpot and enjoy the results a few hours later! A few of my favorite things to have on hand for game-day recipes are Guldens mustard, Hunts ketchup and Hebrew National hot dogs – I like to know that my hot dogs are 100% real meat if you know what I mean. What are your favorite must-haves for tailgating season?! Easy crockpot Asian BBQ lil' smokies! Heat canola oil in a medium saucepan over medium heat. Add garlic, ginger, chili powder, and onion and sauté about 3 minutes. Add soy sauce and brown sugar, and bring to a boil. Cook, covered, over medium-low heat 8 minutes or until onion is tender. 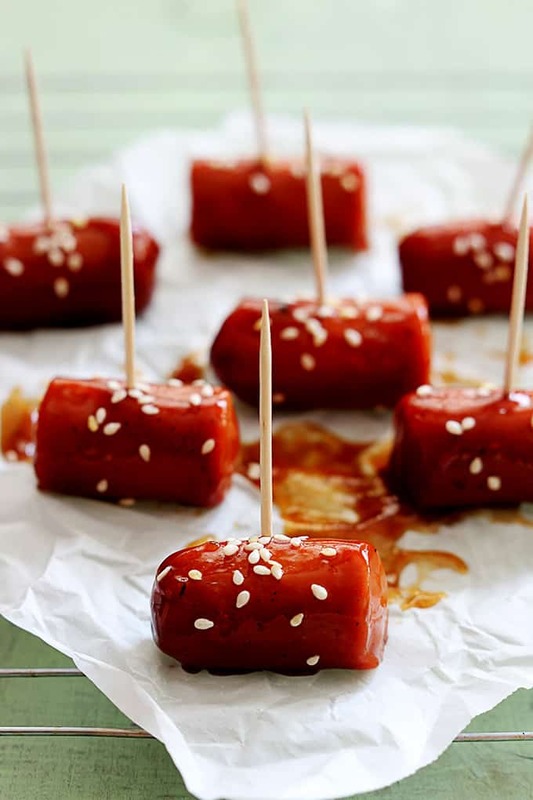 Transfer to a blender; add vinegar, ketchup, mustard, and sesame oil, and process until a chunky puree forms. Add sauce to crockpot. Add hot dogs. Cook on high 2 hours or on low 4 hours. 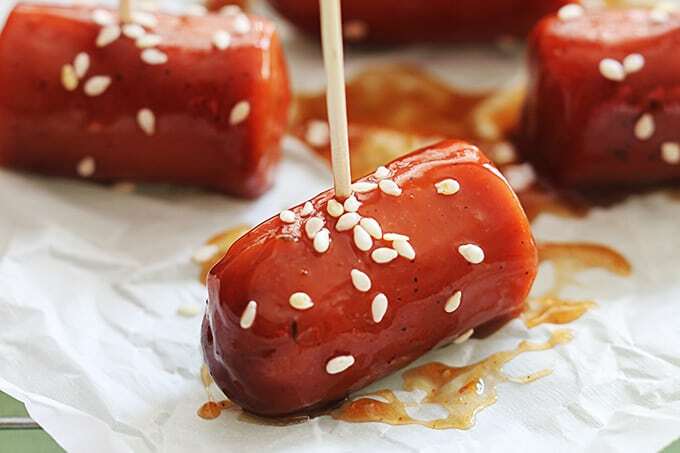 Serve warm and garnish with sesame seeds if desired. And if you’re looking for more game day recipes, I’ve got just the thing! Check out my friend Natalie’s tailgating video for more fun recipes! Click HERE to watch now. With grilling season upon us, everyone is craving an all-American hot dog. What makes a kosher hot dog different? It’s all about what makes the cut (and what doesn’t). Hebrew National is choosy about what goes into their franks – only 100% pure kosher beef so you know what you’re getting and they taste great. Lil' smokies are a classic. Usually it's my sister Kristy who brings them to a party. But recently I made these Asian BBQ style lil' smokies for a family get together and they were such a hit! I didn't mean to steal my sister's thunder but... well, what can ya do. Eat em' and weep I guess! Along with lil' smokies we usually have 7 Layer Dip (or my 9 Layer Dip!! ), and some kind of sliders (everything mini is so much yummier). For this Asian BBQ version lil's smokies, I used Hebrew National hot dogs, I'm kind of picky about my hot dogs - if you are too, I suggest giving these ones a try. I just like to know that I'm eating real meat if you know what I mean. I also used Gulden's mustard and Hunt's ketchup, just a few of my favorite must-haves for game day recipes. But I'm dying to know - what are your favorites?? These saucy Asian BBQ lil' smokies are a cinch to make and will be the big hit of your next party! Whisk together ketchup and next 5 ingredients to slow cooker. Add hot dogs to slow cooker. Cook on high 1-2 hours or on low 4 hours. 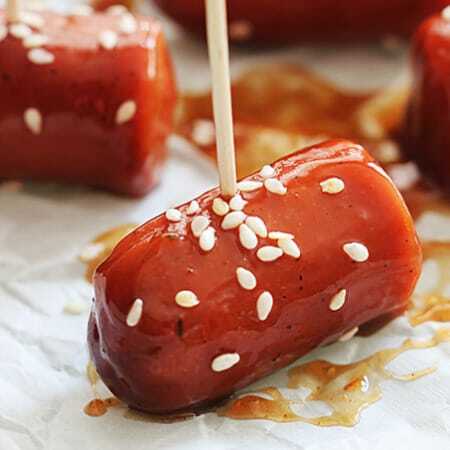 Garnish with sesame seeds if desired and serve.